I received my sample dies recently and couldn't wait to use them BIG GRIN. 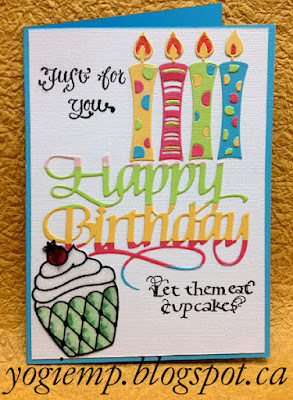 Today's card uses "Happy Birthday" (at Elizabeth Craft Designs and at Quietfire Design). Yogi, That is a gorgeous die for birthday greetings. Sylvia D.
What a happy card!! Love how you did the sentiment! Thanks so much for playing along with us at the CAS-ual Fridays Challenge! Beautiful Birthday card!!! Love the colorful arrangement too. Thanks for sharing with us at Penny's Paper-Crafty. Yummy Yogi. Thank you so much for sharing your lovely creation with us at Creative Card Crew. This is such a beautiful creation. I love this beautiful birthday card. I have never hosted any DIY party but this year on my birthday I would like to throw DIY party at some outdoor party places Miami. Could you please share décor ideas for outdoor birthday party?